Chinese conservatories of music have long clung to classical Western composers such as Beethoven and Mozart as defining the gold standard for study and performance. Ironically, even the Cultural Revolution did not dislodge this allegiance. But China is opening its doors to the world in music as in so many other spheres. This new receptivity has led faculty in Wesleyan’s World Music Program, recognized as international leaders in the study of music from cultures worldwide, to get their passports stamped in Beijing on their way to the Central Conservatory of Music, China’s premier institution of higher education in the arts. Associate Professor of Music Su Zheng was the first of Wesleyan’s faculty to broach the study of world music with Chinese scholars. The daughter of one of China’s foremost orchestra conductors, she was a natural for the role of cultural mediator. She made her first visit in 1992, eight years after having left her native country, and spoke at a national meeting on pedagogy in music. In her opinion, the field of musicology had been closed off to new ideas and study subjects, even as Chinese citizens have become accustomed to interacting with the rest of the world. In 2002, Chen Ziming, a faculty member at the Central Conservatory of Music who was single-handedly teaching world music, invited a contingent of Wesleyan faculty to visit. The late adjunct professor of music T. Viswanathan and artist-in-residence David Nelson, PhD ’91, lectured and gave the first concert of South Indian Carnatic music ever in China. Subsequently, Zheng hosted one of the Central Conservatory’s leading scholars at Wesleyan for a Fulbright-funded study. Zhang Boyu, chair of the musicology department, was the first Chinese scholar in music to receive a Fulbright. He studied with Wesleyan’s World Music Program in order to develop a world music program in China. In turn, he hosted another visit of Wesleyan faculty in 2006, along with Wu Wenguang, PhD ’89, a long-time faculty member at the China Conservatory of Music in Beijing. This cross-fertilization has had tangible results for the Chinese. Adjunct Professor of Music Sumarsam helped the Central Conservatory acquire a gamelan. Though not the first gamelan in China (a set exists in Shanghai for display only), it is the first that is being used for performance, as well as for teaching. Professor of Music Mark Slobin views the China connection as “part of the larger story of the department’s outreach to the world.” For 45 years the department has been a pioneer in interactions with countries such as Indonesia, Malaysia, India, Korea, Japan, Ghana, Taiwan, and Hong Kong, as well as various European states. Former Wesleyan graduate students now teach in universities across Asia, Africa, and Europe. 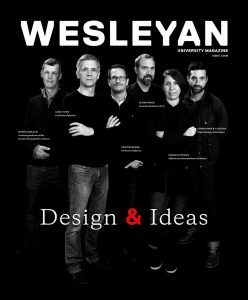 Wesleyan faculty members have acted as cultural ambassadors to other countries and to the United States. Sumarsam, for example, was crucial in revising the Eurocentric view of earlier gamelan scholarship. In all, roughly half the members of Wesleyan’s music department have been to China since 2002. They have been engaged in helping Chinese scholars break up pedagogical paradigms that had their origins in a Soviet model of classical study. As evidence of profound change, Associate Professor of Music Eric Charry will be attending the Second Annual African Music Conference in China. The change in Chinese conservatories, compared to as recently as 20 years ago, is astonishing, according to Zheng. The Chinese, she says, appreciate the aesthetic value of world music, not just its political utility as the country forms alliances in Africa and elsewhere.